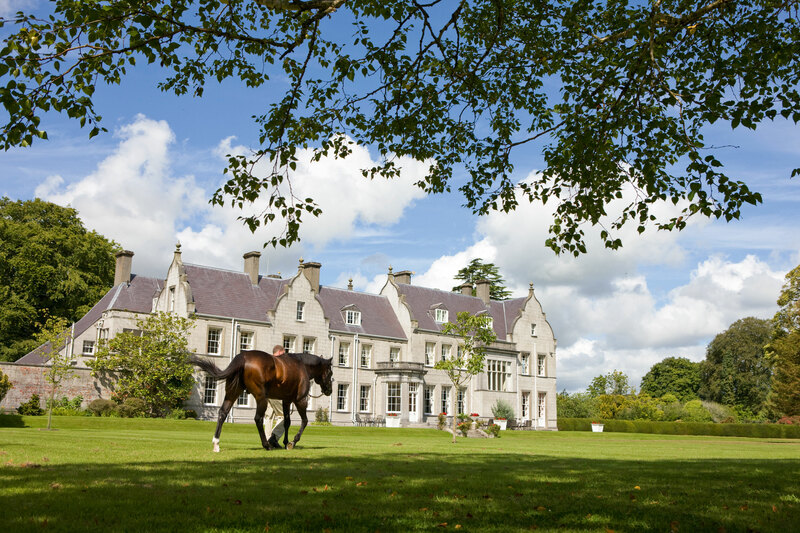 His Highness Sheikh Mohammed’s base in Ireland is Kildangan Stud, just outside Kildare town. The stud was purchased in 1986, but has been part of thoroughbred history for over a century and produced many Champions. Godolphin's operation in Ireland comprises of five farms in County Kildare, one in County Meath and two in County Tipperary. Kildangan itself is home to the Irish-based Darley stallions. It is also used as a breaking and training centre for the majority of Godolphin yearlings in Ireland, and some 20 yearlings are also raised at Kildangan. The farm extends to almost 1,500 acres with combined accommodation for more than 400 horses and there is a team of 250 employees. Whitefield Yard is the purpose-built foaling unit and two Epsom Derby winners have been born here in Shaamit and High-Rise. Other famous horses born in these stables are Mark of Esteem, Swain, Cape Cross and Singspiel. The one-mile all-weather training track is used for training both yearlings and older horses. Horses are also trained and exercised in Kildangan’s large indoor riding arena.